JACKSON, Miss.  A bill that would require physicians to search for a fetal heartbeat before performing an abortion has passed the House. The bill would potentially require women to have transvaginal ultrasounds of the sort that were contested in Virginia recently, because a heartbeat cannot be heard through a traditional ultrasound until five or six weeks into a pregnancy, legislators said. House Bill 1196 contains language similar to the "personhood amendment" language that would have defined life as beginning at conception but was defeated by voters last year. The bill defines an "unborn human individual" as "an individual organism of the species homo sapiens from fertilization until live birth." An amendment to the bill that would have prohibited vasectomies in the state was defeated. 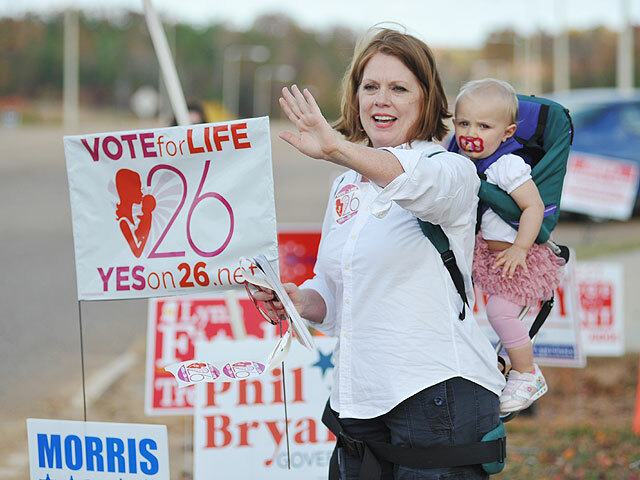 Meanwhile, Mississippi groups that oppose abortion want to put the question to voters again. The opponents will seek another state constitutional amendment to define life as beginning at conception, they told reporters last week at the Capitol. Voters defeated the so-called "personhood amendment" by a wide margin in November 2011. Similar amendments died in this year's Legislature until recently. About two dozen women and children surrounded by 25 empty strollers vowed to again go through the complex process of bringing the amendment to a popular vote. They say the new initiative will address concerns of voters who opposed it last year. They also say they have hired law firm Liberty Counsel to assist in drafting the new initiative. The groups plan to collect signatures in hopes of putting the amendment on the 2013 ballot.